A Banana Grown At Subzero Temps Also Has An Edible Peel : The Salt Banana crops aren't in the best shape, but new varieties could help. Japanese Mongee bananas debuted this winter, bred to be cold-resistant and pesticide-free. Plus, you can eat the peel. Courtesy of D&T Farm Inc.
Japanese Mongee bananas debuted this winter, bred to be cold-resistant and pesticide-free. Plus, you can eat the peel. A Japanese farm introduced a new crop this winter: an organic banana with a peel that's thin enough to eat. In a nod to this appealing outer covering, Setsuzo Tanaka, the banana's inventor, has named his creation the Mongee ("mon-gay") banana — which means "incredible banana" in Japanese. "Setsuzo's original purpose was to make a delicious banana with no pesticides," Tetsuya Tanaka, a spokesperson for D&T Farm, the company behind the banana, writes in an email. Setsuzo Tanaka spent four decades tinkering with tropical fruit before the Mongee was born. But if pesticides were his main concern, why not just grow a normal organic banana? Aren't all bananas equally tasty? Today, most bananas do taste the same. That's because most grocery shelves are stocked with a breed called Cavendish, and they're said to be blander and mushier than a previously popular breed, the Gros Michel. That's "Fat Michael" in French. Gros Michel reigned as the king of all bananas in the 1950s — with a taste some have likened to artificial banana flavor — but poor Michel was almost completely wiped out by a fungus called Panama disease in the 1960s. Panama disease didn't affect Cavendish bananas, so commercial farmers replanted. Setsuzo Tanaka wanted to bring back the richer, sweeter Gros Michel, and he wanted to grow it pesticide-free. In some ways, that was the trickiest part of his project. While Gros Michel bananas are still around on some farms, they're just as susceptible to fungus as ever. Disease threatens the Cavendish banana, too. A similar fungal strain to Panama disease, called Tropical Race 4, has decimated banana crops in recent years. So conventional banana cultivation relies on a mix of fungicides, herbicides and nematocides, says Carla Ng, an environmental engineer at the University of Pittsburgh who has studied pesticide runoff from banana farms. Ng says that the levels of pesticides that wind up in your banana are regulated to be within a safe range for consumption. But her research has found that pesticides sprayed on conventional banana crops can put surrounding ecosystems at risk. "Even when the fruit are perfectly well below [pesticide limits for humans], you can still reach peak concentrations in the environment that are above critical toxic thresholds," Ng says. She says pesticide runoff from bananas can wind up concentrating in waterways, threatening fish and other water dwellers. 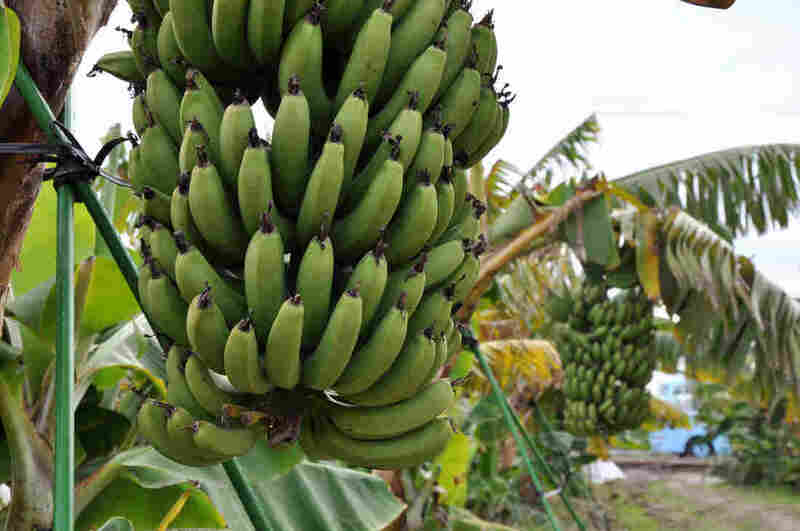 Ng says there's potential for nonorganic, commercial banana farms to improve — avoiding spraying pesticides just before rain, creating buffer areas to filter runoff. But the banana as a species could probably use all the help it can get. Perhaps one day, experiments like the Mongee banana could help keep this crop around, with fewer downstream effects. Setsuzo Tanaka's answer to pests and pesticides is somewhat radical. To avoid both at once, he engineered a breed of Gros Michel bananas for cold resistance, and began growing them at extreme temperatures. D&T Farm plants its crop in very chilly conditions, minus 76 degrees Fahrenheit, then thaws and replants them at warmer temperatures. The temperature-shifted bananas fruit in about nine months, and an interesting side effect of the process is a thinner banana peel. Without any pesticides, the peel is edible, from a practical standpoint. Mongee bananas reportedly sell for $6 each in Japan. Right now, they're very much a boutique crop. If eating banana peels is your thing, the Mongee banana would be a major improvement from the typical bitter, fibrous banana covering. Mongee peels have a lettuce-like texture, according to D&T Farm's Tetsuya Tanaka. 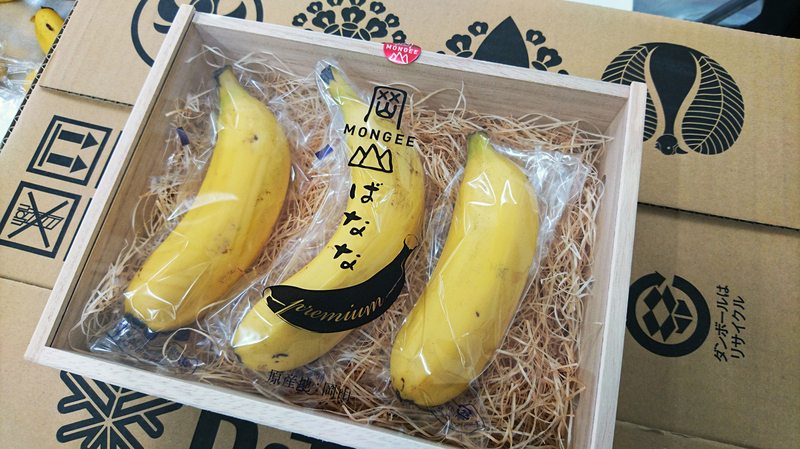 Although Tanaka said in an email that he didn't personally enjoy the peel's taste, he said Mongee peels are mellow compared with an ordinary banana's covering. Japanese journalist P.K. Sanjun tried the peel all by itself and said "it was bitter, but not inedible," SoraNews24 reported. The fruit itself had a different flavor, too, Sanjun said. It was more tropical and pineapple-y than a typical banana. He approved. Finding a Mongee to munch on won't be easy, though. The company says it ships just "hundreds" per week around Japan. At one store, Tenmaya, in Okayama prefecture, between 30 and 60 bananas arrive every Friday. Each banana costs 648 yen, or about $6, and they're all sold by Saturday. Tetsuya Tanaka of D&T Farm preemptively apologized for not being able to send NPR a banana; understandably, it would be quite a feat to send a sample to America. Other companies that have bought plants from D&T might increase supply, but Japanese consumers eat millions of bananas each year. So Mongee bananas are no more than a boutique crop at this point. But for anyone who wants to grow them at home in Japan, D&T Farm plans to offer a cold-resistant potted banana plant soon. It's scheduled to cost $450, but after 75 Mongee bananas, those peels will pay for themselves.